My goal was to run a 5k in under 30 minutes. 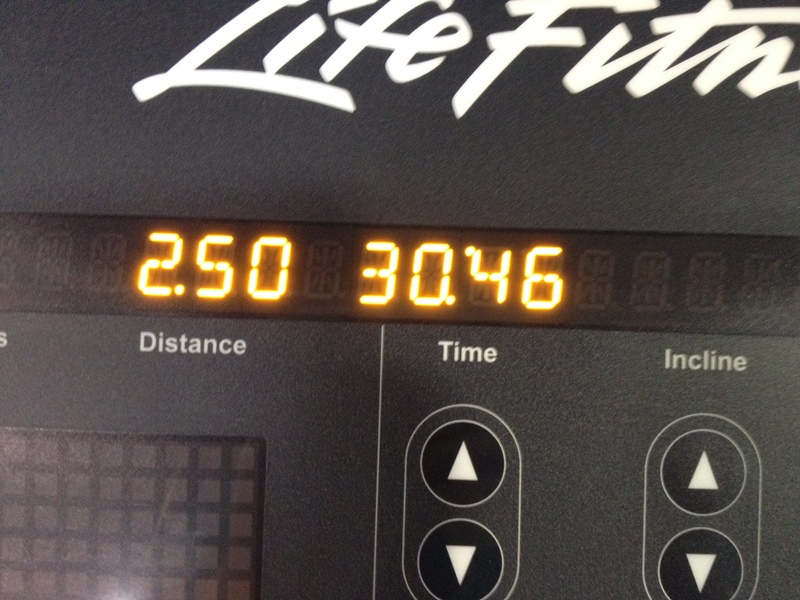 A lofty goal for such a slow runner, but I really want to push myself over the next month or so. I really think I can do it! I hope you enjoy my quick video. I will be sharing all of the posted challenges on here with you guys as well. Let me know what you think! Or if you decide to sign up yourself! Here’s the link to the challenge if you decide to sign up! Become the next face of Under Armour Women! Supercalafragalisticexpialodocious. That’s basically how long that title is. 😉 But trust me that recipe is worth its lengthy title. I didn’t snag any pictures from last night other than the food since no one seemed to want to be in them and it was quite a busy evening. My friend deemed it necessary to go get ice cream. And of course due to a certain time this month I had to have something chocolate so I had soft serve with homemade brownie chunks. Woopsies! Don’t worry my run this morning more than made up for it. I set a personal best! 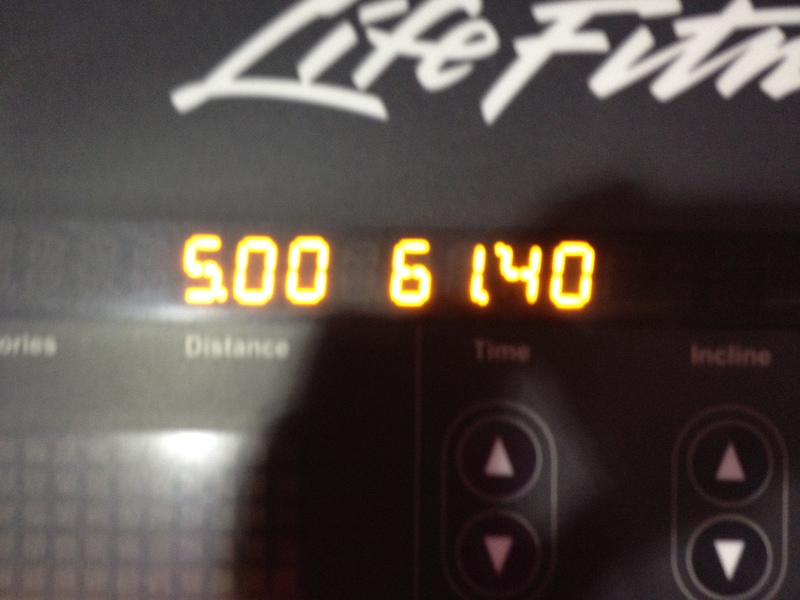 5 miles in 61 minutes! That’s huge for me! This app is clearly helping not only my speed, but also my endurance. So I am loving running lately! I am currently obsessed with running to Timeflies and Kelley James. Check out his new song! It makes me want to sit on the beach and drink some Pina Coladas! Seriously, this song is awesome. Before my run though, I fueled up with a bombshell spell and a protein pancake topped with sliced strawberries and raspberries. These pancakes are just not getting old. Welcome to the new breakfast trend you will be seeing upon this blog. They are just a great way to start your morning and get back on track! For lunch I had a giant fajita bowl beast. I cooked up some ground turkey with minced garlic, chili powder, garlic powder, and onions. I put that on top of a bed of spinach, grape tomatoes, leftover fajita peppers and onions, salsa, and nutritional yeast! It was delicious! I’ll get to the smoothie bowl I had for dinner at the end of the post! 🙂 Love me some teasing. 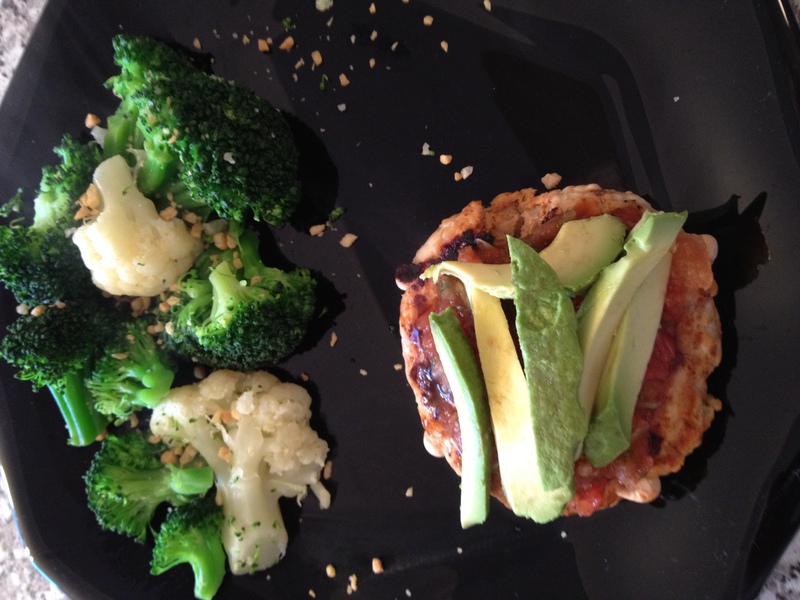 For dinner I made another Taco Burger with a side of steamed broccoli and cauliflower soooo good. I am loving these burgers right now. And now for what you have all been waiting for in this post! I hope you all had an amazing weekend. Let me know if you try that smoothie! Also, if you guys are following Tone It Up they released an awesome video today checking in with all of their new projects if you are interested! 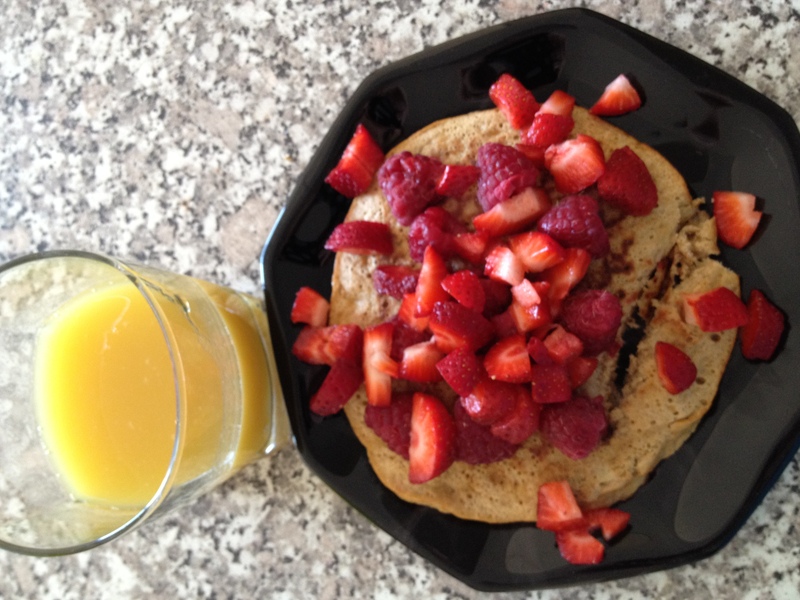 This morning I started off my day right with a chocolate chip protein pancake topped with sliced strawberries. On the side I had my usual Bombshell Spell, which I am actually starting to love. The burn of the vinegar is starting to not phase me anymore. I would love to answer any questions you have or give you my opinion on certain products! 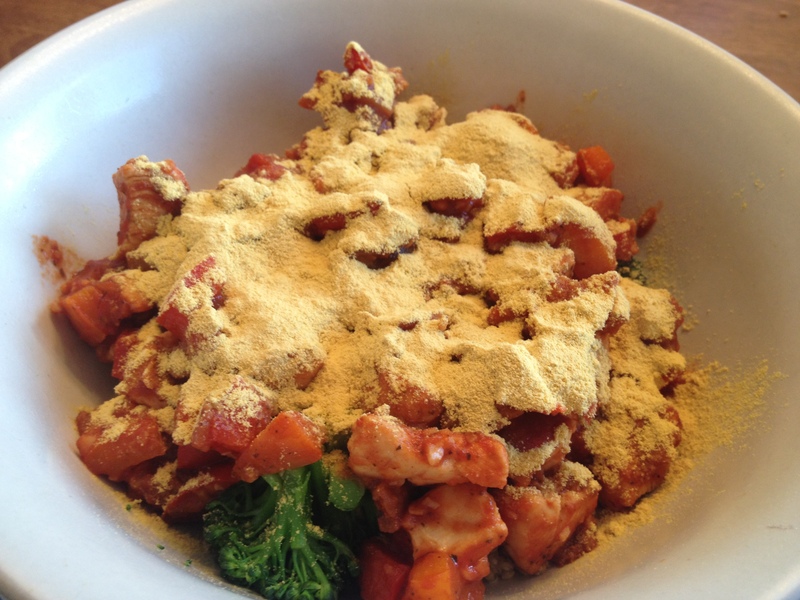 Keep an eye out for another vlog of the superfoods I eat! I am really liking these vlogs. It makes me feel like I am actually talking to you guys haha. Now onto the food! I had some amazing eats yesterday after my intense workout, which was the usual leg workout we have been doing the past month or so. I am about to change up our plan again, so I will keep you posted. We noticed amazing results on this plan, so the next one is going to have to be just as bad arse. 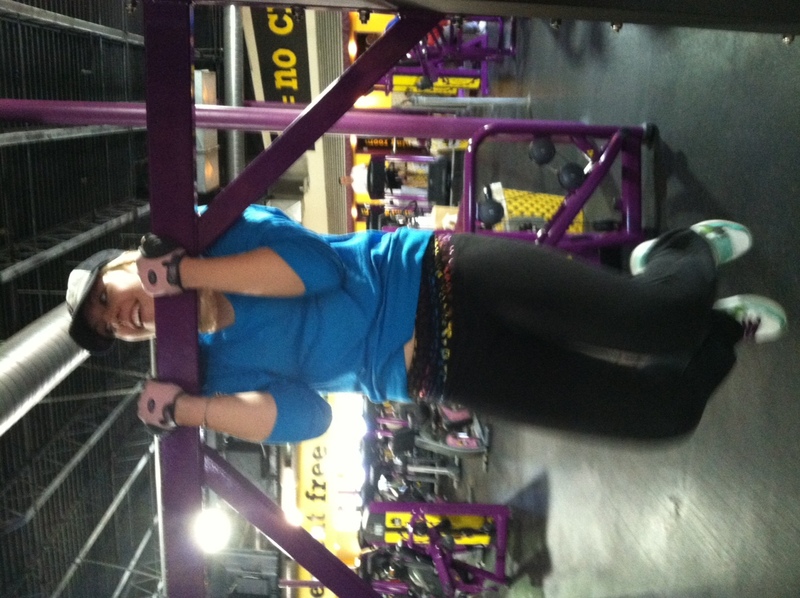 😉 We also had a mini photo shoot while at the gym as proof of our workout! So enjoy our funny little adventure haha. Those are bad arse, right? We thought we looked legit. 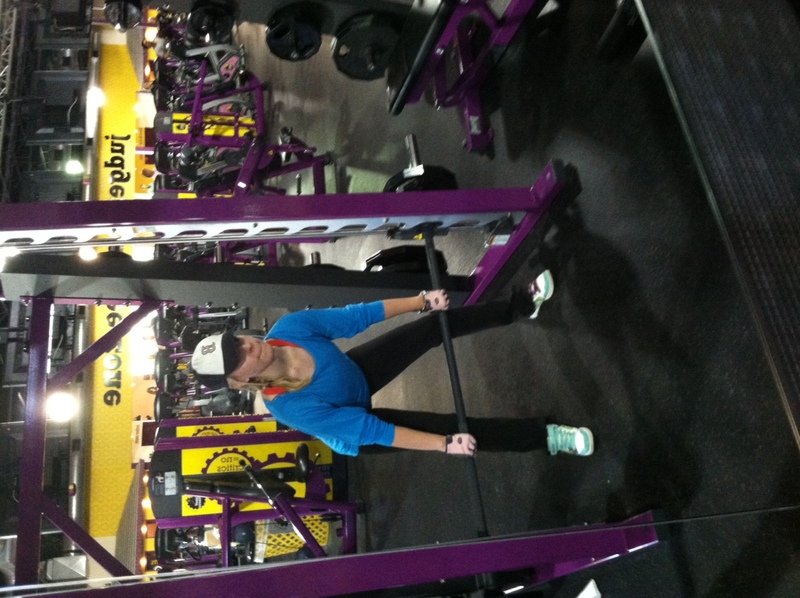 I know it’s a super dorky thing to do, but our gym was pretty empty and we said why the heck not. Now you guys can see what I do, instead of the random form pictures I add to some of my posts! But let’s get to the food shall we? 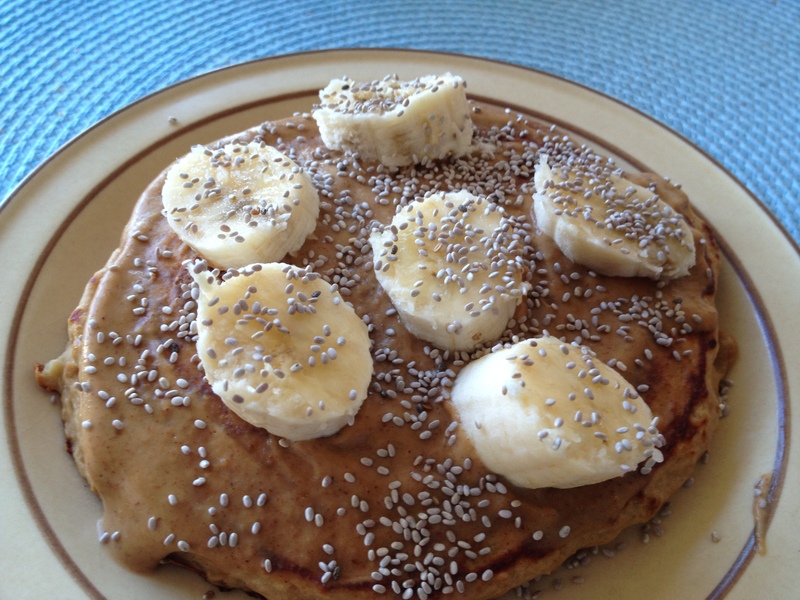 Yesterday morning I started off with a chocolate and peanut butter chip protein pancake topped with cinnamon pb2, the rest of the banana, and chia seeds. It was seriously good! It was like cheating… Only not! 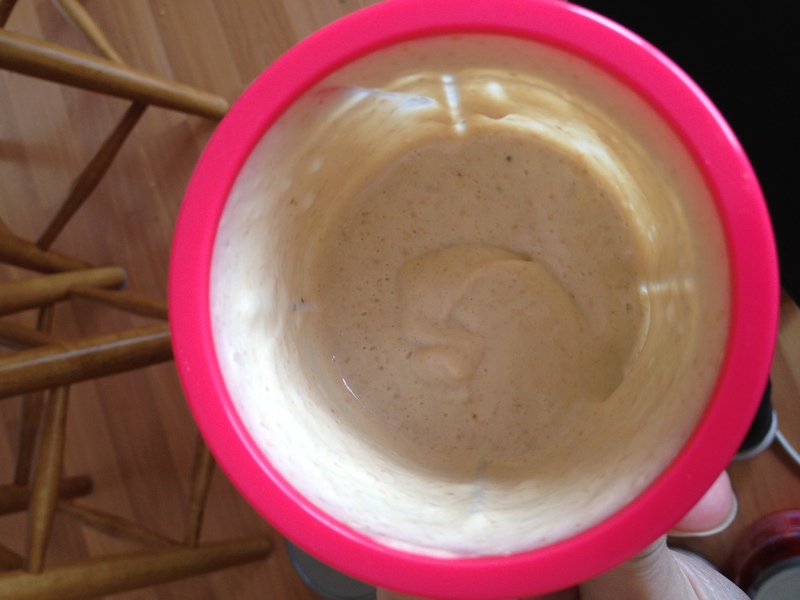 I made it with 1/2 banana, 1/2 tbsp ground flax, scoop of vanilla sunwarrior, and 1/4 cup egg whites. I put sunspire chocolate chips and peanut butter chips in after I put it in the pan. They melted into an amazingly delicious pancake. 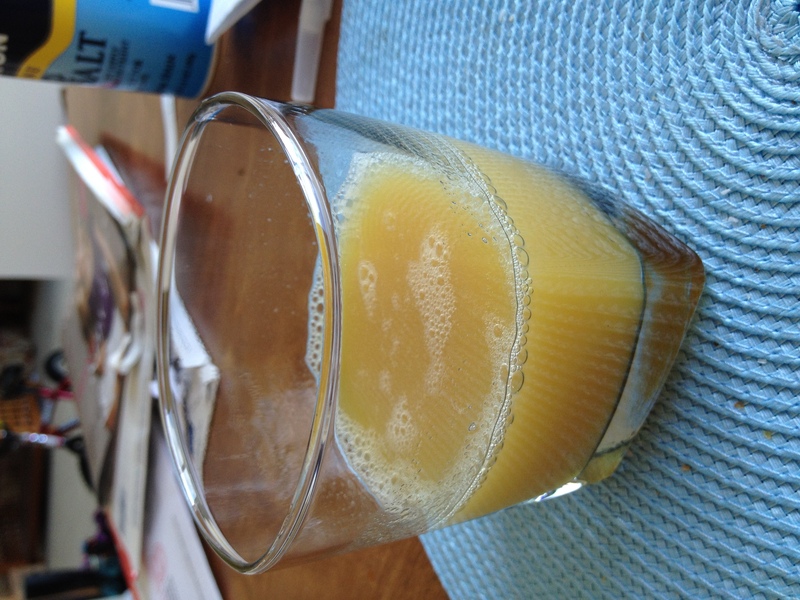 I had my usual Bombshell Spell on the side to kick start my metabolism for the day! 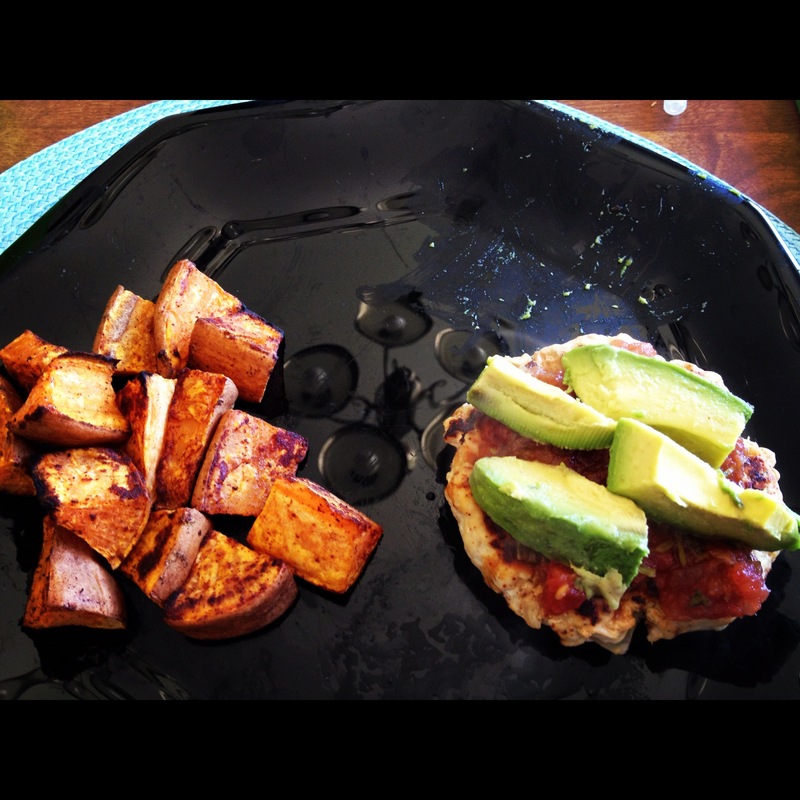 When I got back from my neuroscience class I wanted to eat something before we went to the gym to do legs. 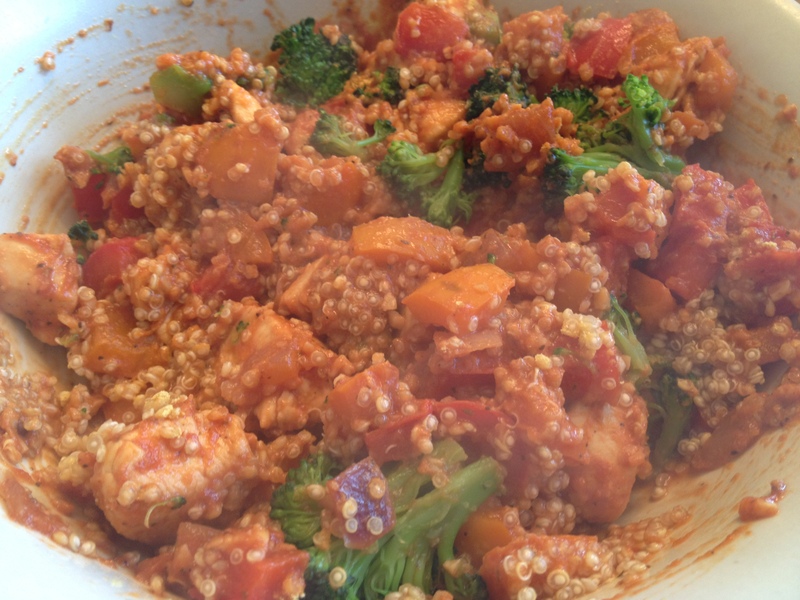 Legs are always a really intense day for us, so I wanted to fuel up beforehand. 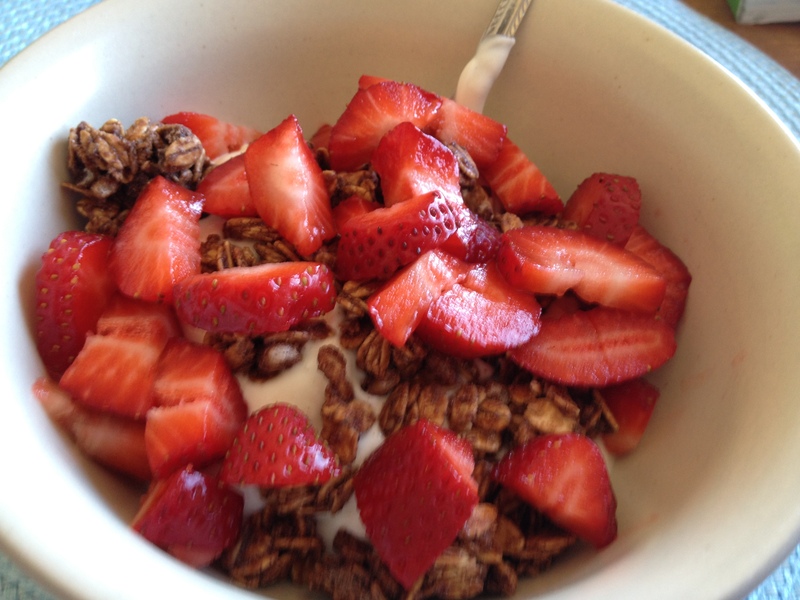 I had a container of Stonyfield Organic Plain Greek Yogurt topped with 1/4 cup Bear Naked Heavenly Chocolate granola, and sliced strawberries. This may be one of my favorite combinations! It definitely kept me full and focused at the gym during our photoshoot. 😉 We were sweating like animals by the way. Also, sorry to all Yankees fans with my hat! Ah! This was the best meal ever! I cut up some sweet potato wedges and threw them on a pan with some extra virgin olive oil, cinnamon, and a packet of stevia. I broiled them for 15 minutes until they were delicious. But that’s not the best part of my meal. The Taco Turkey Burger from heaven! I took 4 oz of ground turkey threw in some chili powder, diced red onion, garlic gold nuggets, and minced garlic. I grilled that up and on top I put some fresh organic salsa and 1/4 of an avocado sliced up. It tasted like the most amazing taco I have ever had in my entire life. It was THAT good! I highly recommend everyone try it. Who needs the bun? I actually hate buns to be honest. They get in the way. Looks amazing, right?! Seriously so good. 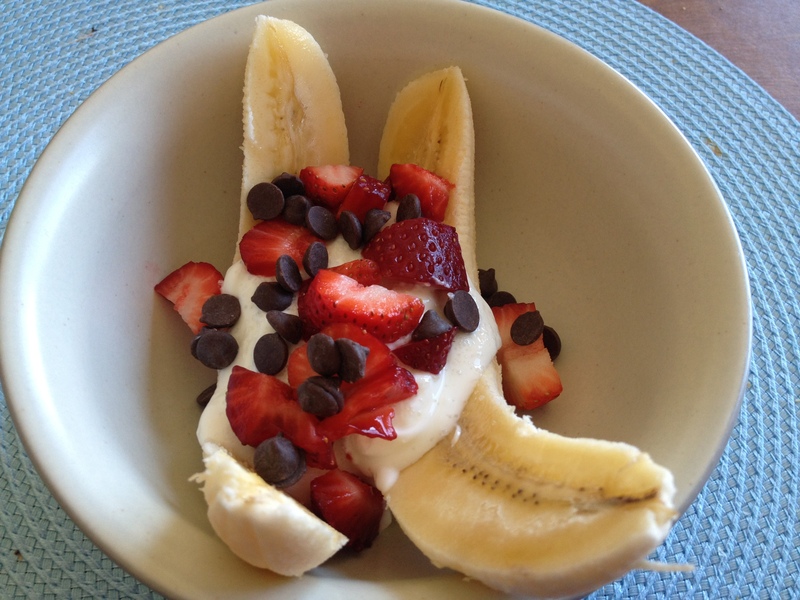 I’m about to go make a Banana Almond Smoothie Bowl. 🙂 I will post the recipe tomorrow if it’s good! You know I love my smoothies. I’m already 60 oz in for Thirsty Thursday, how far are you? Hey guys! Happy Thursday! I am currently in class and not paying attention. 😉 Hey, my weekend is about to start. I cannot be held accountable for my senioritis and lack of concentration. I am posting a vlog later today about the supplements and protein powders that I use on a daily basis, as well as comparing them to ones I have used in the past. I am really picky with supplements so take that with a grain of salt. I’m really not a fan of sucralose (splenda), which is in almost every single protein powder on the market so beware of the rant that will come with that! 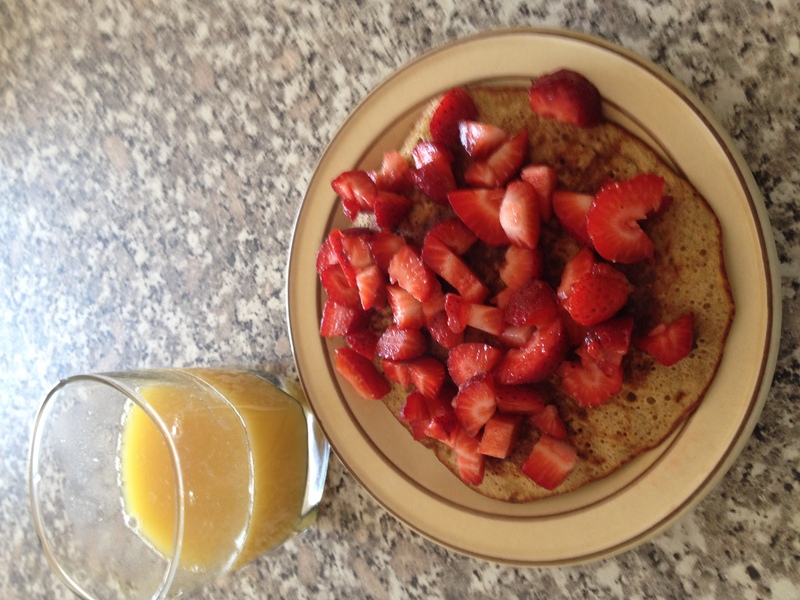 For breakfast I started off again with a protein pancake topped with strawberries. I absolutely love how filling and delicious this breakfast is. 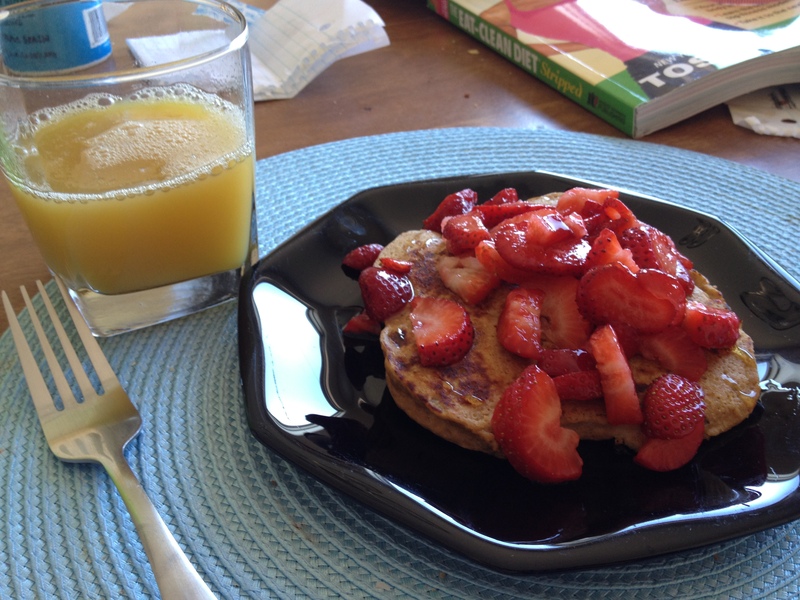 Today’s pancake was even better, but we will get to that in a later post. Also, the Bombshell Spell was consumed and I am just loving how that makes me feel. I can’t get over it. Everyone start making them! Don’t fear the apple cider vinegar. For my mid-morning snack, I didn’t snap a picture because I was in the library, but it was an apple and some of the Mary’s Gone Crackers I blogged about yesterday. Those darn crackers are sooooo good! Everyone go find them! They are so clean and healthy. Now these didn’t make me bloat and they were gluten free. I am wondering if gluten makes me bloat… It doesn’t make me sick or anything, so I don’t have an intolerance I’m just wondering if it’s the bloating culprit. If it is, there are a ton of gluten free clean breads and wraps around I can switch to for a while. Not worried. 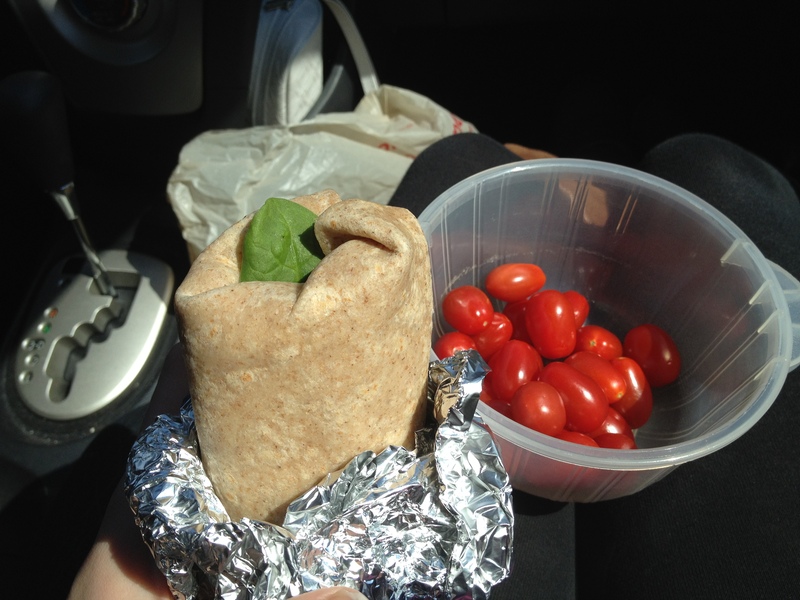 For lunch I had a turkey, spinach, and dijon mustard whole wheat wrap and some grape tomatoes on the side. My gosh did that wrap attack my stomach. I have been eating so clean lately that anything that isn’t clean is like waging war on my body. Hence why this was the only non-clean thing I ate all day. I threw them away once I found out they had sucralose in them and a ton of random garbage. I clearly wasn’t paying attention when I bought them. In case you were wondering the brand, they were Cedar’s. Don’t get them! Yuck! I ended up skipping my afternoon snack because I was at the gym running 2.5 miles on my Couch to 5k (week 3, day 2) app. So when I got home I decided I should just eat dinner since it was 6 pm. 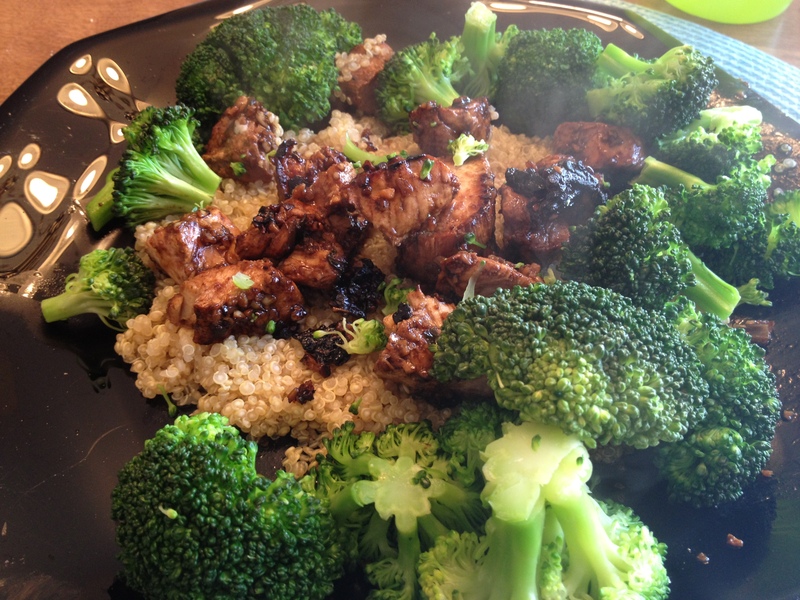 I made a chicken teriyaki quinoa plate with steamed broccoli. It was delicious to say the least. I was a huge fan! I used the same teriyaki sauce from the lunches I have been having. Love that stuff! 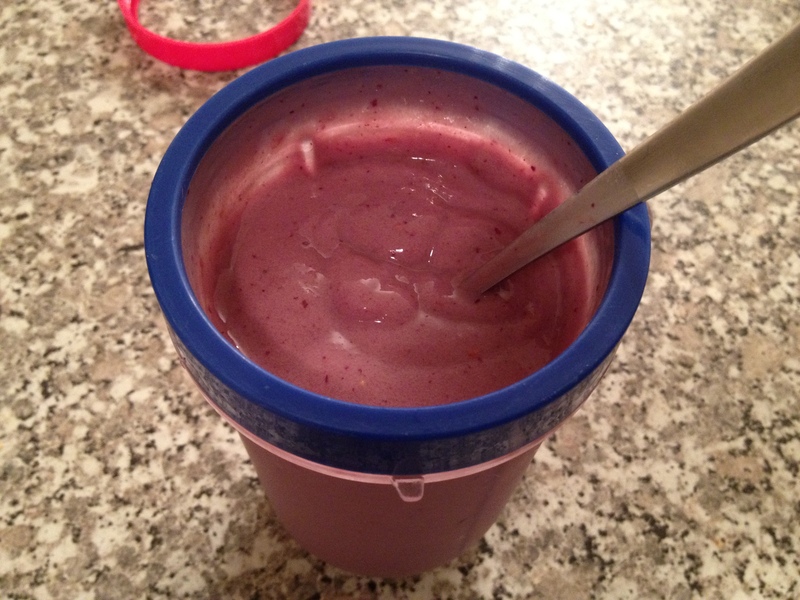 After dinner I had my favorite Crack Berry Smoothie Froyo (made super thick with xanthan gum!) and realized I think I might actually like it better than ice cream. I know, whacko. But seriously, I’m so focused on results and eating clean that this basically is cheating for me. I have no cravings for anything unhealthy anymore. I hope it stays this way for the next eight weeks. I think that posting most of my food is helping me stay accountable, so be prepared to see a lot more of that on here for the next eight weeks. Also, if you are wondering about some of the nutritional stats I am consuming I can start including those. Yesterday was a really low calorie day, because I wasn’t raging in hunger and I ate a ton of protein and fiber keeping me full. Plus, I didn’t weight lift. So my hunger tends to get curbed when I am just running. 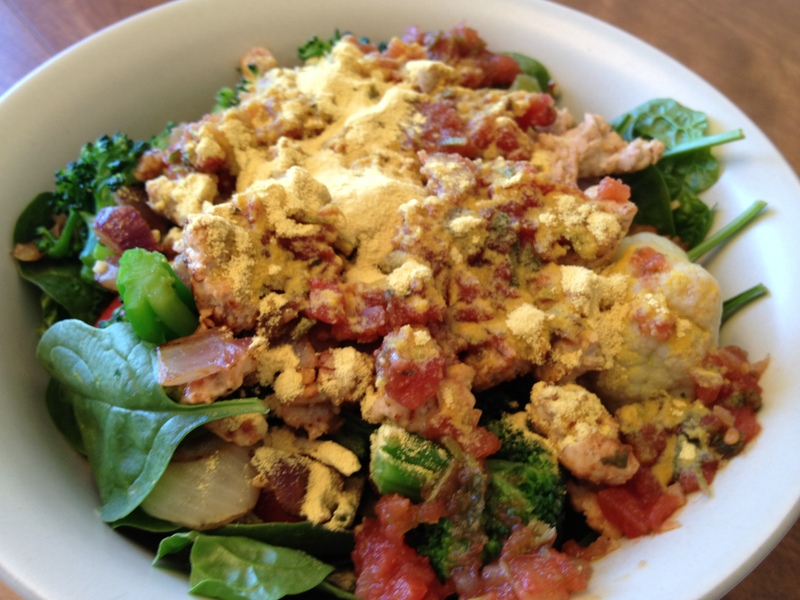 Overall though, I consumed 1476 calories with 26g of healthy fats, 213g of carbs, 43g of fiber, 115g of protein. Pretty sweet, right? I have a leg workout going on today so I promise there will be a higher caloric intake today. 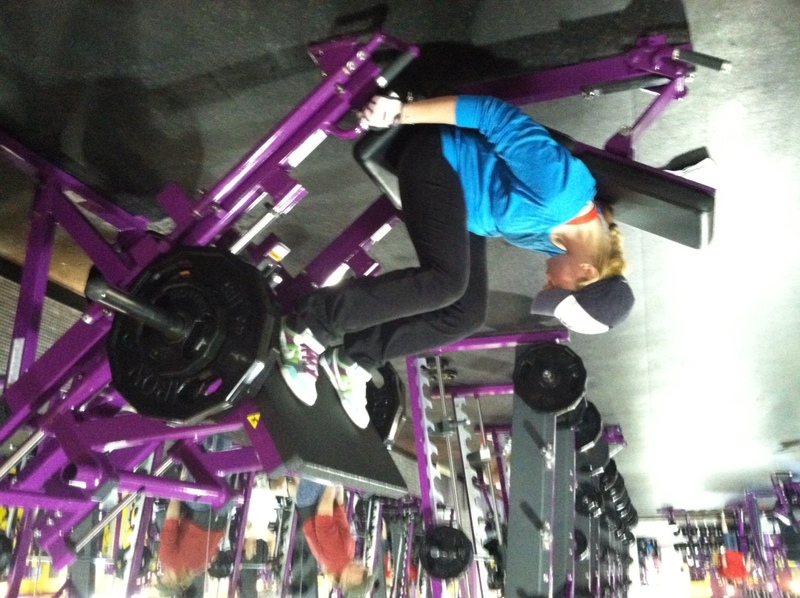 😉 Nothing like a leg workout to increase my appetite! 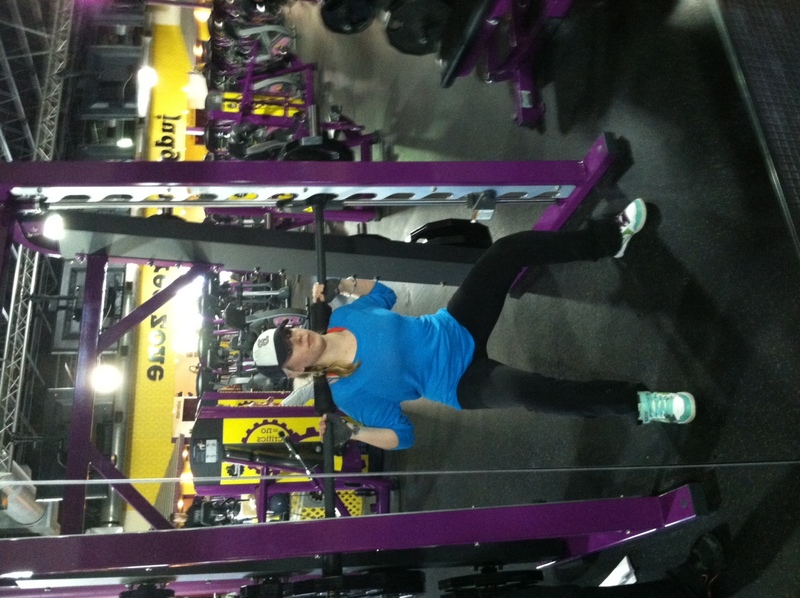 Stay tuned tomorrow for that post and look back in a couple hours for my supplement vlog! Love you guys, have an amazing thirsty Thursday! Drink up that water… Pina colada… or beer. 😉 Hey, it’s almost summer right?! Also, the best part is yet to come besides the taste. They contain 450 mg. of omega-3 fatty acids per 1oz serving.The serving size is 13 crackers for 140 calories, 5g of fat (all being good for you fats even though that sounds high don’t fear the fat! ), 160 mg of potassium, 190 mg of sodium (super low for a cracker! ), 21g of carbohydrates (0g from sugar! and 3g of fiber! 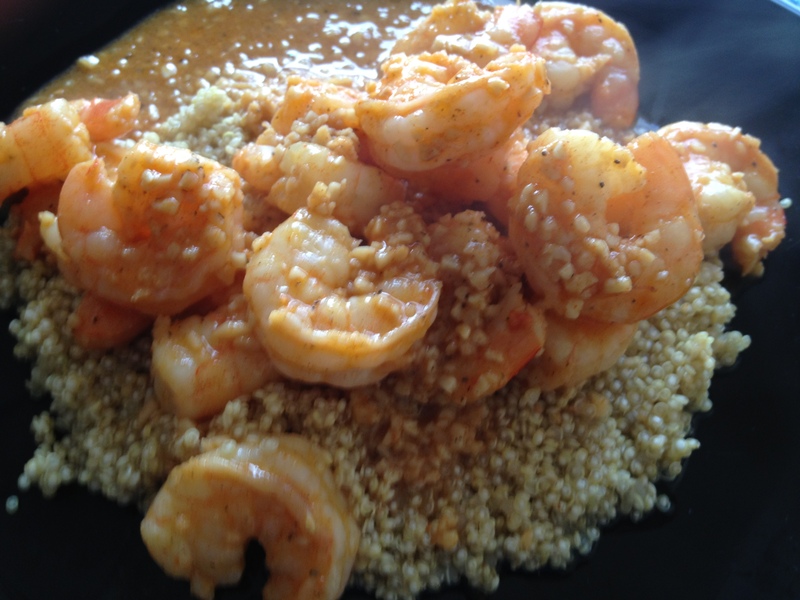 ), you also get 3g of protein. There is nothing bad about these chips, guys! I have found the holy grail. WIAW #7 and a Vlog! Happy Humps Day!!! I am super excited this morning because I filmed a vlog for all of you about my 5 day slim down results! The video will be at the bottom of this post for those of you who just want to see my WIAW post. 🙂 Basically this WIAW is what I did on the slim down. You guys get to see what a typical day was for me, then if you’re curious you can watch the video and see the results. Spoiler: I feel amazing! 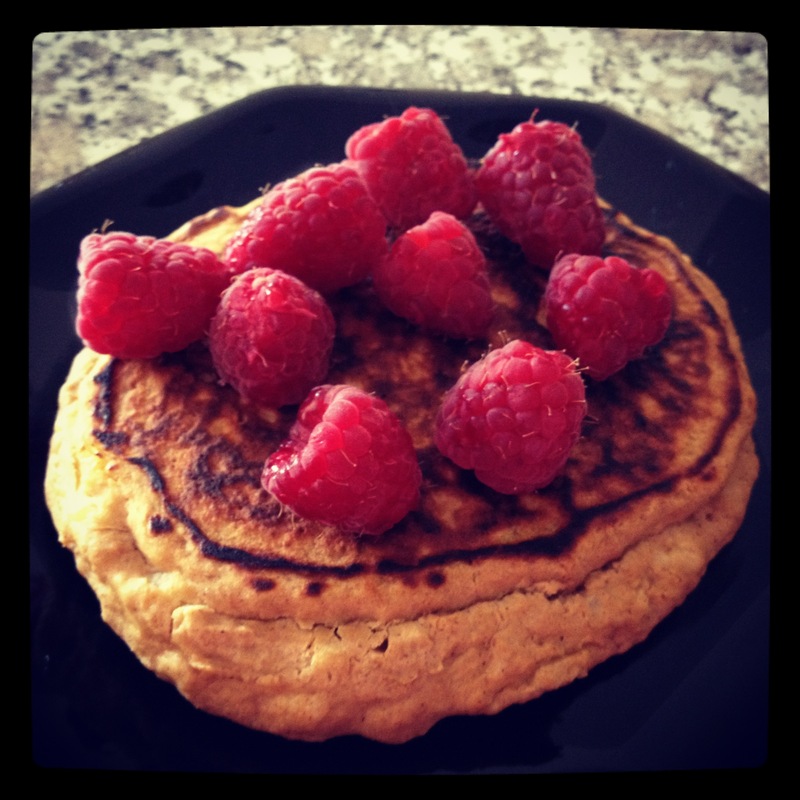 For breakfast I had a slim down protein pancake topped with raspberries. Loved the addition of the raspberries. Normally I do blueberries or strawberries, but let me tell you those babies tasted amazing. I had another pancake this morning. I am now stuck in a protein pancake habit. Hope you all don’t mind. 😉 I also have a bombshell spell every morning to kick up my metabolism and help my tummy digest better! I had an apple plus a chocolate Zico. I did manage to take a picture of the Zico haha. By the way, these are amazing! They have great nutritional stats and this one tastes like chocolate milk. 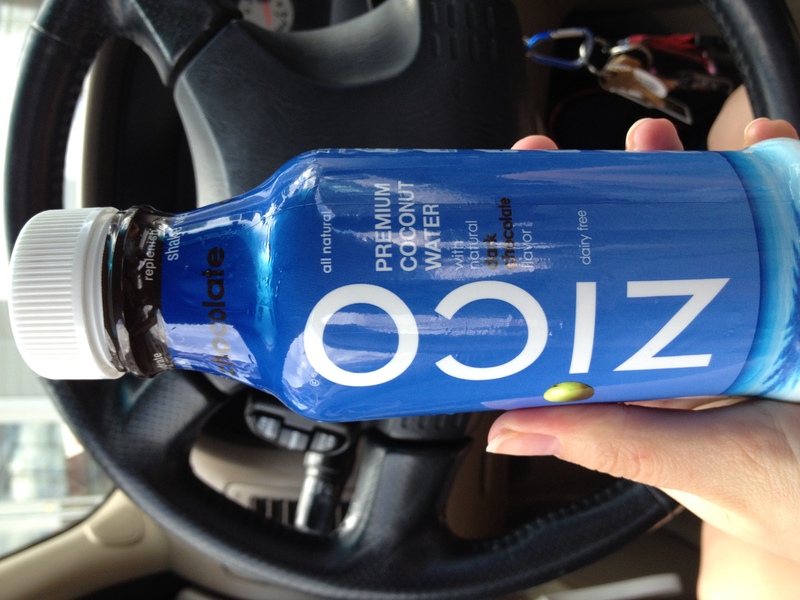 I hate every other Zico flavor, but this one satisfies my chocolate craving and helps hydrate me after a sweat fest. I love LOVE it. It has like 680 mg of potassium, which is more than a banana. It has electrolytes to refuel after your workout. 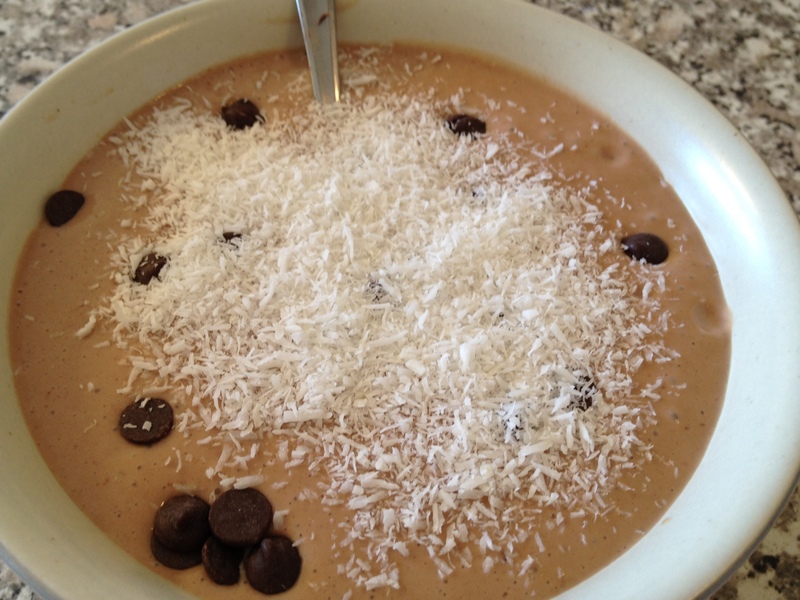 Simple carbs from the chocolate, so it’s awesome when paired with a protein after a workout to drive the protein into the muscles and is only 110 calories. Chump change for people who workout. 🙂 I highly recommend it. It will definitely be with me through my half marathon training and during that actual half itself to keep me hydrated. Hydration is super important every single day! So drink up! 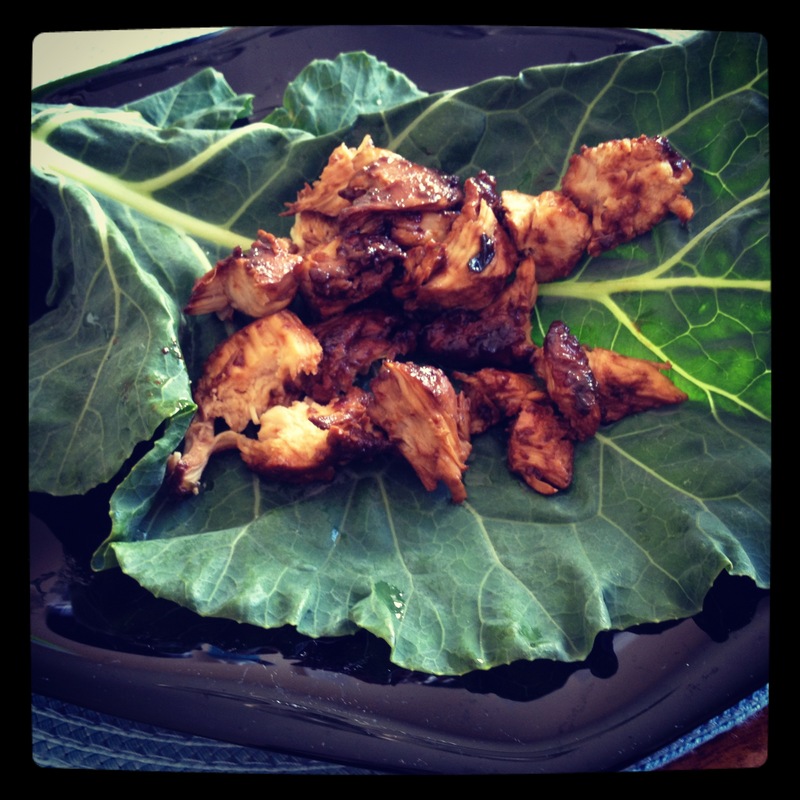 Every day on the slim down I had chicken teriyaki collard wraps. I am obsessed with these. 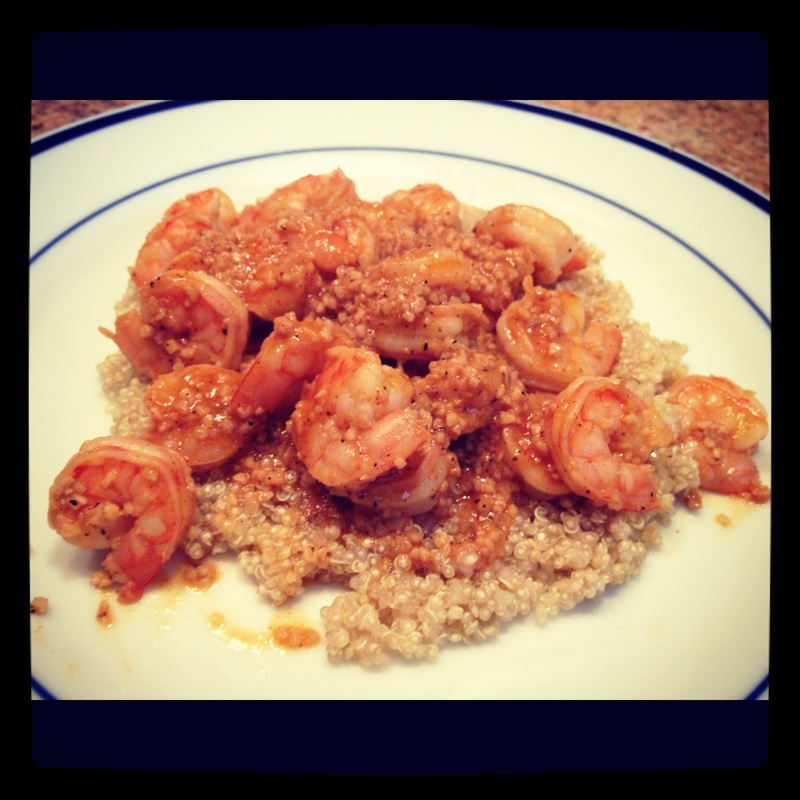 They taste soooooooo amazing and they are super awesome for you! They have a nice little vegetable kicker and a protein punch. What more could you ask for in a lunch?! 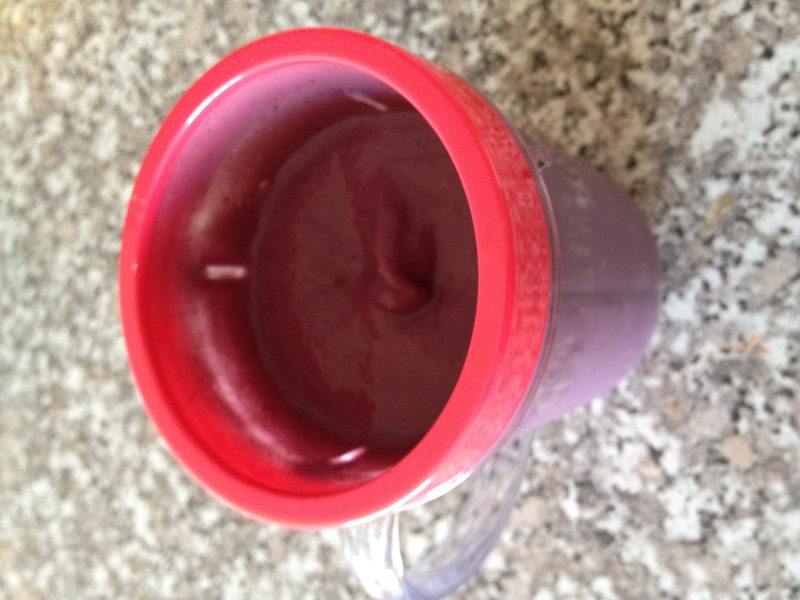 The same smoothie recipe I posted the other day. My crack berry smoothie wonder. I am doing a vlog soon reviewing some of the protein powders and supplements I use if you guys are curious. I’ll talk about why I chose them and the taste. I hope that’s helpful, because sometimes I get questions on Twitter. I had a bowl of blueberries and blackberries a couple hours after dinner when I got hungry. Sorry there was no picture, the lighting was awful! Senior at the University of New Hampshire and a Kappa Delta. Trying to figure out how to balance living a healthy life while still being me. Addicted to Sweedish Fish, Peanut Butter, and Cupcakes. Currently training for a Half Marathon in October. Thanks for stopping by!